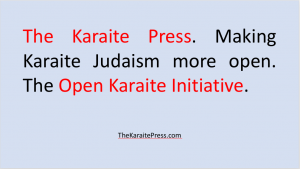 Today, The Karaite Press (a project of the Karaite Jews of America) launches its Open Karaite Initiative. In short, this project will advance access to historical Karaite Jewish literature like never before. The KJA is planning to bring all of its Karaite literature online and make it available for free (with very few use restrictions). And as a show of good faith, The Karaite Press is releasing the fully typeset .pdf of The Palanquin on its site. Did we already mention “for free”? First, the good news. Yes, you can now get The Palanquin free simply by downloading it from The Karaite Press’ web-site. Now, the better news. You can share it, post it to any web-site, use it for your own research. The only thing you cannot do with it is sell it commercially (i.e., don’t print a book or turn it into an ebook). It is our hope that if you download the book, you consider donating to The Karaite Press. Literally, the only way to continue to fund these books is, well, with funds. Last fall, I spoke with the KJA about opening up many if not all of its projects. I warned them that this would mean we may sell fewer books. One overarching theme came through. Karaism is not suffering because we have failed to sell enough books. Karaism is suffering (at least in part) because our literature is locked up and is not accessible to those who are interested. Releasing the Palanquin is a first step. Over time, we will release other works – in some form or another. In the meantime, enjoy this treat. Oh, and if you have not yet purchased The Sayings of Moshe (the newest release), please do. It offers a wonderful and fresh perspective on the Karaite Jewish experience. I think it’s a great initiative! Despite a lower sale of books, this will certainly help a lot of people. And I believe that any conscious person will donate and keep buying the books. Todah raba. This is an excellent idea. This will give more people the opportunity to know the Karaite’s and their history. I know you are a missing part of Jewish history. I recall reading a book about Jewish history (I don’t recall the title). I remember saying to myself that something was missing; something just didn’t make sense. At the time I didn’t know what it was and now I do.